The 303rd Bomb Group (H) Association published in May 2002, the two-volume 1,246-page hardbound�set� titled�"Hell's Angels Newsletter Silver Anniversary Collection; A World War II Retrospective. "�The reprinting of all 86 editions of the Association's newsletter from April 1976 to November 2001, fully�indexed,�served to tell in dramatic detail�the Group's role in the United States Eighth Air Force in the European Theater of Operations from November 1942 to April 1945. The�books covered aerial combat missions, ground support achievements, military awards, famous B-17 Flying Fortresses, escapes and evasions, prisoners of war, airmen killed in action, memorials and postwar events. The 303rd Bomb Group, known as "Hell's Angels," flew more�combat missions (364) than any other B-17 bombardment group during World War II. As a�unique reference work, the anthology proved�of special merit to scholars doing research as well as�to others interested in first-hand accounts of aerial warfare against Nazi Germany.� The two volumes were illustrated with hundreds of color and black/white photos, many taken during the war. Out of a�print run of 500 sets, 40�were designated for donation to the libraries of universities and colleges, military bases, museums and communities in the United States and Europe. The books are out of print, but following is a list of those institutions that received the publication. 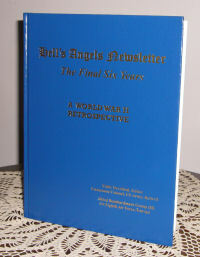 In�January 2008, the 303rd Bomb Group (H) Association published the 560-page hardbound volume "Hell's Angels Newsletter; The Final Six Years–A World War II Retrospective." It was a chronological sequel to the earlier�Volumes I and II,�but was designed to stand alone and not necessarily as Volume III.��To make its contents more readily accessible, the book concluded with a 54-page index. The principal goals in publishing were to present the book as a gift to every living veteran of the 303rd Bomb Group as the Association phased out and to continue to perpetuate the history of the bombardment unit that flew the most B-17 combat missions during World War II. Out of a print run of 900 books, a�large number were designated for donation to the libraries of universities and colleges, military bases, museums and communities in the United States and Europe. Although�the book is sold out and a�second printing is not planned, following is a list of those institutions that received the publication.